Your Thanksgiving meal will be extra special with this scrumptious roast turkey recipe. Butter blended together with rosemary and thyme is inserted under the skin on the breast of the turkey, providing the turkey with a hint of flavor from these fresh herbs. 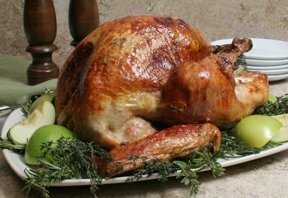 See how easy it is to cook your own delicious roasted turkey for a special Thanksgiving dinner. Is this your first time making homemade dressing? Watch how simple it is to create tasty dressing to serve with your Thanksgiving turkey.